Always adjust the audio while the vehicle is stopped: Do not adjust the audio control switches while driving the vehicle. Adjusting the audio while driving the vehicle is dangerous as it could distract your attention from the vehicle operation which could lead to a serious accident. Even if the audio control switches are equipped on the steering wheel, learn to use the switches without looking down at them so that you can keep your maximum attention on the road while driving the vehicle. For the purposes of safe driving, adjust the audio volume to a level that allows you to hear sounds outside of the vehicle including car horns and particularly emergency vehicle sirens. To prevent the battery from being discharged, do not leave the audio system on for a long period of time when the engine is not running. If a cellular phone or CB radio is used in or near the vehicle, it could cause noise to occur from the audio system, however, this does not indicate that the system has been damaged. Do not spill any liquid on the audio system. Do not insert any objects, other than CDs, into the slot. AM signals bend around such things as buildings or mountains and bounce off the ionosphere. Therefore, they can reach longer distances than FM signals. Because of this, two stations may sometimes be picked up on the same frequency at the same time. 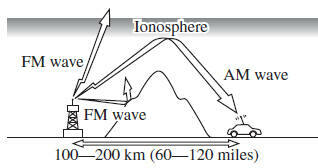 An FM broadcast range is usually about 40—50 km (25—30 miles) from the source. Because of extra coding needed to break the sound into two channels, stereo FM has even less range than monaural (non-stereo) FM. Signals from an FM transmitter are similar to beams of light because they do not bend around corners, but they do refl ect. Unlike AM signals, FM signals cannot travel beyond the horizon. Therefore, FM stations cannot be received at the great distances possible with AM reception. Atmospheric conditions can also affect FM reception. High humidity will cause poor reception. However, cloudy days may provide better reception than clear days. 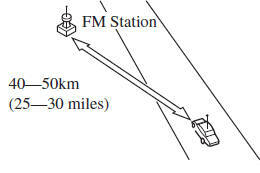 Since FM signals can be refl ected by obstructions, it is possible to receive both the direct signal and the refl ected signal at the same time. This causes a slight delay in reception and may be heard as a broken sound or a distortion. This problem may also be encountered when in close proximity to the transmitter. Signals from an FM transmitter move in straight lines and become weak in valleys between tall buildings, mountains, and other obstacles. 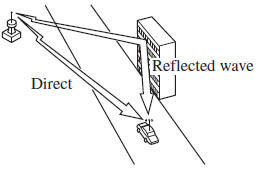 When a vehicle passes through such an area, the reception conditions may change suddenly, resulting in annoying noise. In suburban areas, broadcast signals become weak because of distance from the transmitter. Reception in such fringe areas is characterised by sound breakup. This occurs very close to a transmitter tower. The broadcast signals are extremely strong, so the result is noise and sound breakup at the radio receiver. 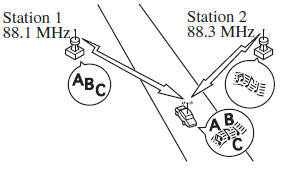 When a vehicle reaches the area of two strong stations broadcasting at similar frequencies, the original station may be temporarily lost and the second station picked up. At this time there will be some noise from this disturbance. Immediately after turning on the heater when the vehicle is cold, the CD or optical components (prism and lens) in the CD player may become clouded with condensation. At this time, the CD will eject immediately when placed in the unit. A clouded CD can be corrected simply by wiping it with a soft cloth. Clouded optical components will clear naturally in about an hour. Wait for normal operation to return before attempting to use the unit. The following precautions should be observed. Do not use deformed or cracked CDs. The disc may not eject resulting in a malfunction. Do not use non-conventional discs such as heart-shaped, octagonal discs, etc. If the memory portion of the CD is transparent or translucent, do not use the disc. A new CD may have rough edges on its inner and outer perimeters. If a disc with rough edges is used, proper setting will not be possible and the CD player will not play the CD. In addition, the disc may not eject resulting in a malfunction. Remove the rough edges in advance by using a ball-point pen or pencil as shown below. To remove the rough edges, rub the side of the pen or pencil against the inner and outer perimeter of the CD. When driving over uneven surfaces, the sound may jump. CDs bearing the logo shown in the illustration can be played. No other discs can be played. Use discs that have been legitimately produced. If illegally-copied discs such as pirated discs are used, the system may not operate properly. Be sure never to touch the signal surface when handling the CDs. Pick up a CD by grasping the outer edge or the edge of the hole and the outer edge. Do not stick paper or tape on the CD. Avoid scratching the reverse side (the side without a label). The disc may not eject resulting in a malfunction. Dust, fi nger smudges, and dirt can decrease the amount of light refl ected from the signal surface, thus affecting sound quality. If the CD should become soiled, gently wipe it with a soft cloth from the centre of the CD to the edge. Do not use record sprays, antistatic agents, or household spray cleaners. Volatile chemicals such as benzine and thinner can also damage the surface of the CD and must not be used. Anything that can damage, warp, or fog plastic should never be used to clean CDs. The CD player ejects the CD if the CD is inserted upside down. Also dirty and/ or defective CDs may be ejected. Do not insert cleaning discs in the CD player. Do not insert any disc with a peel-off seal affi xed to it. This unit may not be able to play certain CD-R/CD-RWs made using a computer or music CD recorder due to disc characteristics, scratches, smudges, dirt, etc., or due to dust or condensation on the lens inside the unit. Storing CDs in the vehicle exposed to direct sunlight or high temperature may damage the CD-R/CD-RWs, and make them unplayable. CD-R/CD-RW exceeding 700 MB cannot be played. It is possible that certain text data, such as titles, recorded on a CD-R/CD-RW may not be displayed when musical data (CD-DA) is playing. The period from when a CD-RW is inserted to when it begins playing is longer than a normal CD or CD-R. Completely read the instruction manual and cautions for CD-R/CD-RWs. Do not use discs with cellophane tape adhering, partially peeled off labels, or adhesive material exuding from the edges of the CD label. Also, do not use discs with a commercially-available CD-R label affi xed. The disc may not eject resulting in a malfunction. This unit plays fi les with the extension (.mp3) as MP3 fi les. Do not use an audio fi le extension on fi les other than audio fi les. In addition, do not change the audio fi le extension. Otherwise, the unit will not recognise the fi le correctly resulting in noise or a malfunction. Supply of this product only conveys a license for private, non-commercial use and does not convey a license nor imply any right to use this product in any commercial (i.e. revenue-generating) real time broadcasting (terrestrial, satellite, lead and/or any other media), broadcasting/streaming via the Internet, intranets and/or other networks or in other electronic content distribution systems, such as pay-audio or audio-ondemand applications. An independent license for such use is required. For details, please visit http://www. This audio system handles MP3 fi les that have been recorded on CD-R/CDRW/ CD-ROMs. When naming an MP3 fi le, be sure to add an MP3 fi le extension (.mp3) after the fi le name. 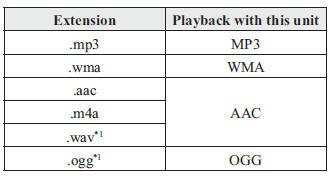 Abbreviation for “MPEG Audio Layer 3”. A technical standard for audio compression as decided by the ISO *1 MPEG working group. Use of MP3 allows for audio data to be compressed to approximately a tenth of the source data size. This unit plays fi les with the extension (.wma) as WMA fi les. * Microsoft and Windows Media are registered trademarks of Microsoft Corporation U.S. in the United States and other countries. WMA fi les written under specifi cations other than the indicated specifi cation may not play normally or fi les or folder names may not display correctly. The fi le extension may not be provided depending on the computer operating system, version, software, or settings. In this case, add the fi le extension “.wma” to the end of the fi le name, and then write it to the disc. AAC stands for Advanced Audio Coding, which is standardised voice compression established by the ISO *1 working group (MPEG). Audio data can be created and stored at a higher compression ratio than MP3. This unit plays fi les with the extensions (.aac/.m4a/.wav*2 ) as the AAC fi les. AAC fi les written under specifi cations other than the indicated specifi cation may not play normally or fi les or folder names may not display correctly. The fi le extension may not be provided depending on the computer operating system, version, software, or settings. In this case, add the fi le extension “.aac ”, “.m4a”, or “.wav *2 ” to the end of the fi le name, and then write it to the memory. Immediately after turning on the heater when the vehicle is cold, the DVD or optical components (prism and lens) in the DVD player may become clouded with condensation. At this time, the DVD will eject immediately when placed in the unit. A clouded DVD can be corrected simply by wiping it with a soft cloth. Clouded optical components will clear naturally in about an hour. Wait for normal operation to return before attempting to use the unit. Do not use deformed or cracked DVDs. Do not use non-conventional discs such as heart-shaped, etc. The disc may not eject resulting in a malfunction. If the memory portion of the DVD is transparent or translucent, do not use the disc. A new DVD may have rough edges on its inner and outer perimeters. If a disc with rough edges is used, proper setting will not be possible and the DVD player will not play the DVD. In addition, the disc may not eject resulting in a malfunction. Remove the rough edges in advance by using a ball-point pen or pencil as shown below. To remove the rough edges, rub the side of the pen or pencil against the inner and outer perimeter of the DVD. DVDs bearing the logo shown in the illustration or DVD-R/DVD R/DVDRW/ DVD RW written with video data (DVD-Video/DVD-VR fi le) can be played. Be sure never to touch the signal surface when handling the DVDs. Pick up a DVD by grasping the outer edge or the edge of the hole and the outer edge. Do not stick paper or tape on the DVD. Dust, fi nger smudges, and dirt can decrease the amount of light refl ected from the signal surface, thus affecting sound quality. If the DVD should become soiled, gently wipe it with a soft cloth from the centre of the DVD to the edge. Volatile chemicals such as benzine and thinner can also damage the surface of the DVD and must not be used. Anything that can damage, warp, or fog plastic should never be used to clean DVDs. The DVD player ejects the DVD if the DVD is inserted upside down. Also dirty and/or defective DVDs may be ejected. Do not insert cleaning discs in the DVD player. RWs made using a computer or DVD recorder due to disc characteristics, scratches, smudges, dirt, etc., or due to dust or condensation on the lens inside the unit. Do not use discs with cellophane tape adhering, partially peeled off labels, or adhesive material exuding from the edges of the DVD label. Also, do not use discs with a commercially-available DVD-R label affi xed. The disc may not eject resulting in a malfunction. The conditions in which a DVD video can be played may be pre-determined depending on the intentions of the disc software creator. Functions may not operate as the user intends because this DVD player operates according to the design intentions of the software creator. Always refer to the instructions accompanying the disc to be played. Manufactured under license by Dolby Labouratories, Inc.. Dolby and the double-D symbol are trademarks of Dolby Labouratories. R/DVD-RW/DVD RW can be played. This unit is compatible for playback of dual-layer DVD/DVD-R. Regional number for this unit is . DVD-Video/DVD-VR fi les written under specifi cations other than the indicated specifi cation may not play normally or fi les or folder names may not display correctly. DVD-Video is a video image storing standard determined by the DVD forum. “MPEG2”, a global standard in digital compression technologies, has been adopted which compresses on average about 1/40th of the image data and stores it. In addition, a variable-rate coding technology, which changes the assigned information amount according to the shape of the screen image, has been adopted. Audio information can be stored using Dolby digital instead of PCM (Pulse Code Modulation) and more realistic sounding audio can be enjoyed. In addition, various, supplementary functions such as multi-language availability are provided for enhanced enjoyment. DVD-VR is short for DVD Video Recording Format; video image storing standard determined by the DVD forum. One of the DVD player's functions. Because scenes can be recorded in multiple angles (camera position), users can choose a desired angle. As a function of the DVD player, audio or subtitles for the same video images can be stored in multiple languages and the language can be selected freely. 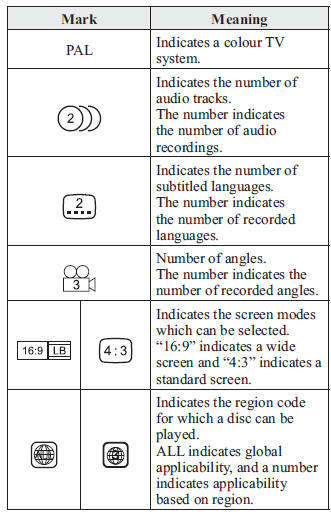 DVD players and discs are assigned codes for each market region and only discs manufactured for that specifi c region can be played. A disc cannot be played if the region code assigned to the player is not indicated on the disc. In addition, even if a region code is not indicated on the disc, disc playback may be prohibited depending on the region. In this case, a disc may not be playable in this DVD player. OGG is the audio compression format for Xiph. Org Foundation. This unit plays fi les with the extension (.ogg) as OGG fi les. OGG fi les written under specifi cations other than the indicated specifi cation may not play normally or fi les or folder names may not display correctly. The fi le extension may not be provided depending on the computer operating system, version, software, or settings. In this case, add the fi le extension “.ogg” to the end of the fi le name, and then write it to the disc. Playback may not be possible depending on the type and condition of the USB fl ash memory even if the audio fi le complies with the standard above. A copyright protected WMA/AAC fi le cannot be played in this unit. The order of the music data stored in the device may differ from the playback order. To prevent loss or damage of stored data, we recommend that you always back up your data. If a device exceeds the maximum electric current value of 1,000 mA, it may not operate or recharge when connected. Do not pull out the USB device while in the USB mode (only pull it out while in FM/AM radio or CD mode). The device will not operate if the data is password protected. MP3/WMA/AAC/OGG *1 fi les written under specifi cations other than the indicated specifi cation may not play normally or fi les/folder names may not display correctly. This unit supports playback of music fi les recorded to an iPod. The iPod may not be compatible depending on the model or OS version. In this case, an error message is displayed. Remove the iPod when it is not in use. Because the iPod is not designed to withstand excessive changes in temperature inside the cabin, it could be damaged or the battery may deteriorate due to the excessive temperature or humidity inside the cabin if it is left in the vehicle. If the iPod battery is deteriorated, the iPod may not recharge and playback may not be possible when it is connected to the unit. For details on using the iPod, refer to the iPod instruction manual. When connecting the iPod to a USB port, all commands are made from the audio unit. iPod control is not possible. The audio unit cannot display images or videos stored in an iPod.